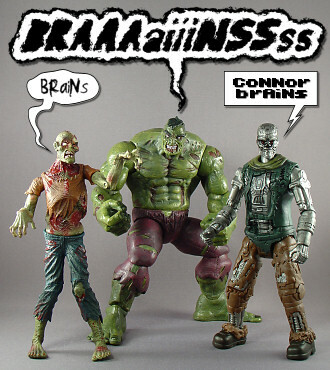 After Terminator 3: Rise of the Machines squandered the Terminator series's popular momentum by kinda sucking, the franchise became something of a niche fanboy property. It was explored further in spinoff material like comic books (one story even featured Superman battling the cyborgs) and obscure novels, but -- fond memories of the first and second movies notwithstanding -- Terminator all but vanished from the greater public consciousness. And then, with the news of a fourth movie on the horizon, Fox debuted "Terminator: The Sarah Connor Chronicles": a brilliant show that not only imbued me with an unflappable love for the lovely Lena Headey (not even The Boring could diminish my devotion), but also revitalized my interest in the Connor-hunting cyborgs and Skynet's global design. Suddenly, whereas I hadn't bothered to watch more than 23 successive minutes of T3 during any of its numerous television airings, I was excited to see Terminator Salvation and eagerly looked forward to its May 21, 2009 release. (That excitement lessened a bit with the news of TSCC's cancellation, and my interest in subsequent films is pretty much nil since I saw Salvation and it also sucked -- more on that in an upcoming review -- but still.) 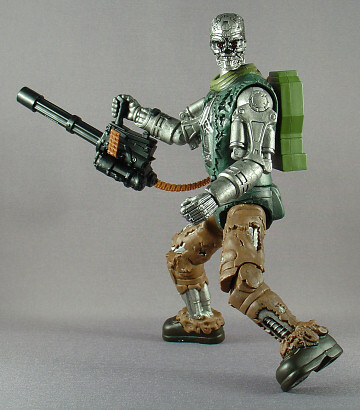 So while I would much rather have had TSCC figures, my anticipation of the fourth film led me to grab a T-600 figure from Playmates Toys's Terminator Salvation line. 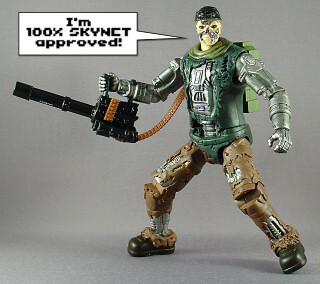 And as you might have guessed from the title of the article, that toy is the subject of today's action figure review! In keeping with its model number, the T-600 is an earlier Terminator than the ones most often seen in the series -- given that Salvation begins before the creation of the Arnold model (T-800 and later T-850), these guys are the ones that get the most screentime in the latest installment. The sculpt does a pretty serviceable job of recreating the look of the T-600s from the film (or at least from the concept art), with mechanical parts that look great and match the movie Terminators fairly well. 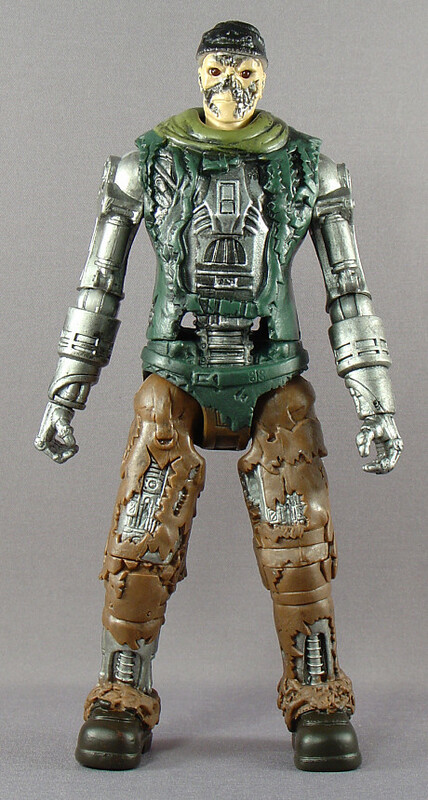 Still, the need to make the toy's limbs solid pieces -- as opposed to multiple connected pieces, which would have allowed for more gaps and crevices and given the appearance of a robot composed of various parts -- does give this toy a simplistic and less convincing look. The clothes are also problematic in this respect. Whereas the T-600s in Salvation tramped around in dirty, shredded rags, the softness of the sculpted clothes makes this guy look as if his ensemble is comprised of torn sheets of rubber... or, rather, sheets of rubber with big teeth and wavy shapes deliberately cut into them. 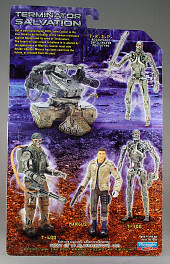 All of this is fine for a toy -- but just as a real T-600 wouldn't have convinced a human of its... well, humanity with that towering height and exposed mechanical areas, neither will the Playmates T-600 convince you that it belongs on the same shelf with your NECA or McFarlane Terminator figures. And then there are problems caused by the way the articulation affects the sculpt. The skin-covered head looks fine at the neck, but the completely smooth neck on the endo head -- while mostly buried in the torso and thus not a total distraction -- still looks pretty weird. The shoulders look fine, but the elbows look surprisingly plain. I mean, here's a place where I really wouldn't mind seeing a visible pin or something else to indicate the mechanical nature of the joint (see how the elbows looked on the actual T-600s) and it's completely smooth. Moreover, why couldn't Playmates have replicated that smoothness for the figure's knees, which break the sculpt and look pretty awful when bent? 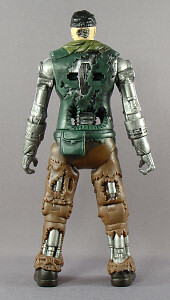 Given that the T-600 figure has this rubbery-looking clothing anyway, perhaps Playmates should've added some overhanging pieces to cover up the unsightly gash in that bent knee... not to mention the awkward hips. Oh, and since the sculpted belt hangs below the figure's waist, there's nothing to diminish the ugliness of the cut joint there. Sigh. If it sounds like I'm really down on the look of this figure, though, that's not entirely the case -- it's just that this is obviously a toy and not a collector figure. It does have some standout elements, though. There's one scene in the film in which you only see the big stompy boots of an approaching T-600, and this figure really nails those with feet that are large and appropriately stompy (yes, that's today's secret word, so SCREAM REAL LOUD). Even the bunched up pants around the feet, while still a bit soft, look more like ragged cloth than deliberately cut sheets of rubber. From the ankles down, this figure is awesomely sculpted. Okay, I kid (though I do dig those stompy boots) -- I also really like both of the interchangeable heads. The one with the rubber skin particularly appeals to me (I think it's the black skull cap), though the clean one looks fine too despite its somewhat bulbous appearance. That said, the heads -- and the heads of Playmates's T-600 figures across various scales -- are problematic for one major reason: they look almost nothing like those of the T-600s seen in the film! Now, these do match the concept art quite well, and that's obviously what Playmates was working from. But somewhere along the line, the filmmakers decided that instead of T-600s looking like this, they should look like this. 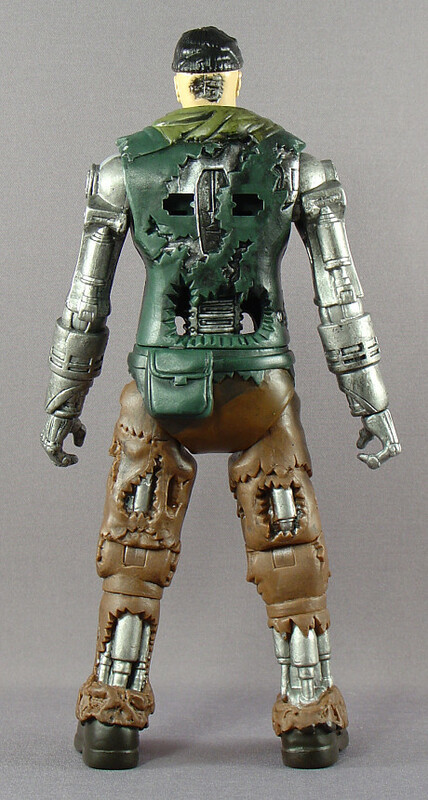 There were lots of T-600s with mostly skull heads and ragged bits of rubber skin around their jawlines, but rarely if ever was one seen with a completely clean mechanical head or with as much skin as the "damaged" head included with this toy. (Even though this seems to be the look Playmates was going for with the first head, note the completely exposed lower face.) Throughout the film, I kept thinking that they looked like mechanical zombies -- Skynet's answer to the Tarman. 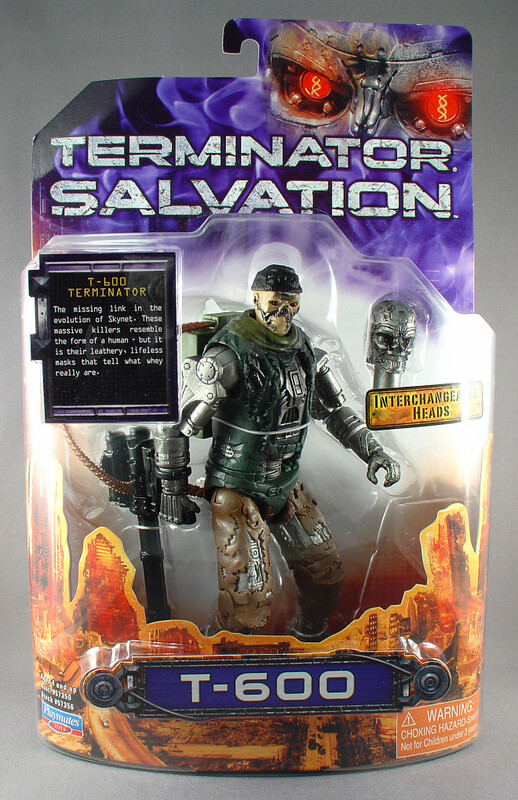 So while it's not really Playmates's fault that the T-600s were altered during Salvation's production, it bears mentioning that the company's T-600 figures fail to capture that zombified appeal. If nothing else, the mouth on the skull head should have been gaping open (and the mouths on the T-700 and T.R.I.P. figures should have been closed). In the paint category, the T-600 fares somewhat better. The metal parts have an appropriately metallic sheen to them, and everything has been given a black wash (there may even be some drybrushing) that helps to highlight the detail in the sculpt and make the figure look kinda dirty -- which, given that these things were crawling through a filthy, crumbling wasteland in the movie, is completely appropriate. The colors on the clothes, on the other hand, seem a bit too vibrant. It might not be Playmates's fault, since I'm almost certain that these colors showed up on some promotional art, but a muted khaki or paler asparagus would have been a better choice for the T-600's top than that lush dark green. 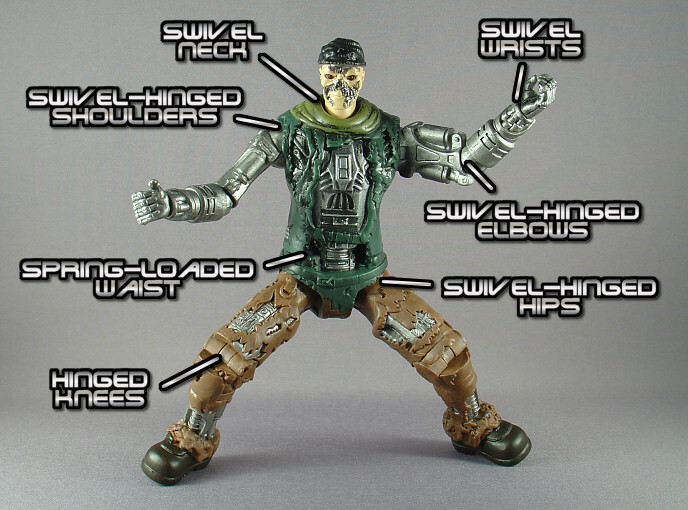 There are also unpainted elements, like the belt and fanny pack -- which, when combined with the low-hanging shirt, sort of make it look like the T-600's crotch is completely unpainted. At least the painted elements are painted well enough. Really, the main problem with the paint is similar to one of my issues with the sculpt... or perhaps it's that no matter how good the paint is, it can't really elevate the sculpt. 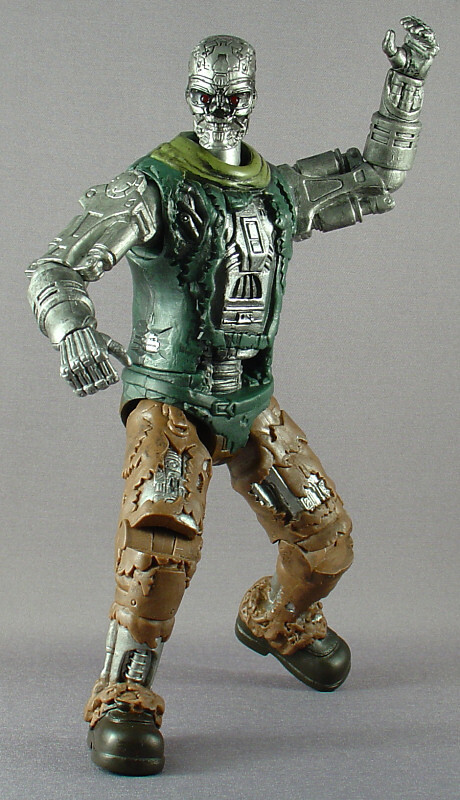 In any case, the problem is this: this is a children's toy, yet the paint job -- with its metallic sheen and dirty wash -- is more akin to that of a collector figure. I mean, paint job aside, this figure is in the same class as Ben 10 and Power Rangers (not to mention Playmates's own Teenage Mutant Ninja Turtles) toys, so it really didn't need advanced techniques. It does mean that more lenient collectors will be able to display the T-600 with figures from specialty lines and not feel so bad about it -- and of course the kiddies won't care that this guy has better paint than their other figures -- but I think I would've preferred a simpler paint job and a slightly lower price point. 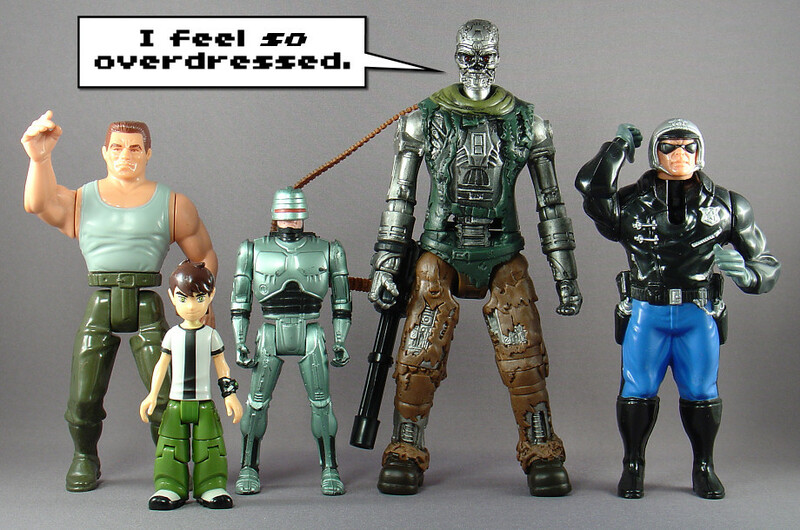 The T-600 has the distinction of being the most articulated figure in Playmates's 6" line. That's not saying a lot, mind you, given that the majority of them have only cut hips, but still. The removable heads move on a standard swivel, which is neither ideal nor terrible. Yes, as a 7.25" figure, it'd be nice for him to be able to look down on all of the puny figures beneath him... and at the same time, he's a giant, clunky robot that has clearly fallen into disrepair, so a stiff neck isn't out of place. Despite his weathered condition, however, our friend does much better below the neck -- combined with the cut wrists, the swivel-hinge shoulders and elbows allow the T-600 to assume a variety of arm poses. And while the waist articulation is useless for posing, the hip and knee joints allow you to get the T-600 into a handful of standing and ambulatory poses -- the latter of which usually involve one foot more/less flat on the ground and the other balancing on either the toes or the side. Ankle articulation and thigh swivels would have enabled the T-600 to get both feet flat on the ground in these poses, but those big, stompy boots make it easy to keep the figure stable in poses that would have other figures toppling onto their sides at the slightest disturbance. So we've already noted that the figure comes with two interchangeable heads... but since most figures don't come with an extra noggin, I figured I'd mention it here as well. Yes. Two heads. Each of which features light-piped eyes, which -- for those of you who aren't familiar with Transformers toys -- means that the eyes are a clear piece of plastic that terminates in an exposed area on the head, such that when you shine a light on the T-600's head(s) his eyes light up as well. 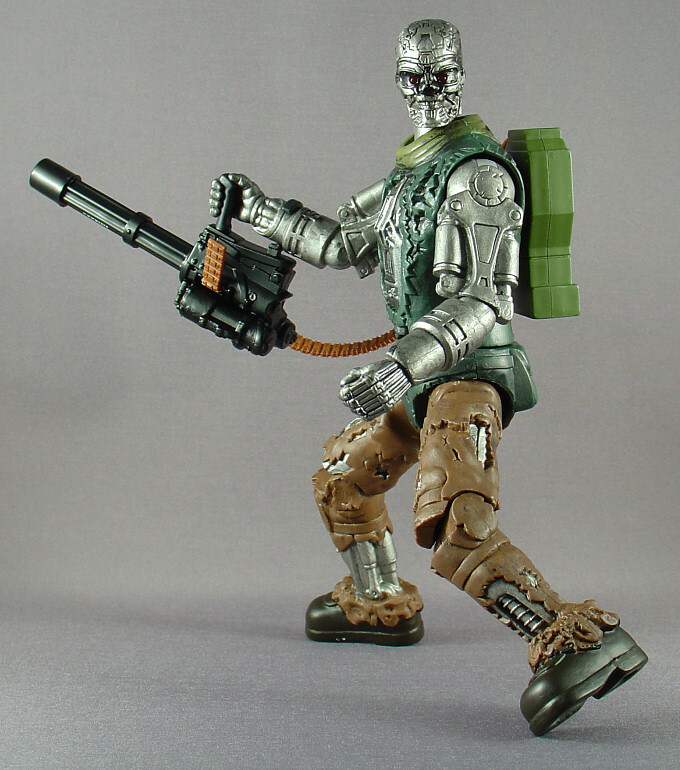 It's a hard feature to photograph (at least with my setup), but Mike Crawford's review of this figure (as well as the T-700 and T.R.I.P.) captures it quite well. The endo head also has a longer neck peg than the fleshy one for some reason, which -- combined with its the fact that it's a bit larger than the fleshy head -- means that it actually looks like a different head as opposed to a fleshy head with the skin all go-o-o-one. It's a really minor issue, but it's worth noting. 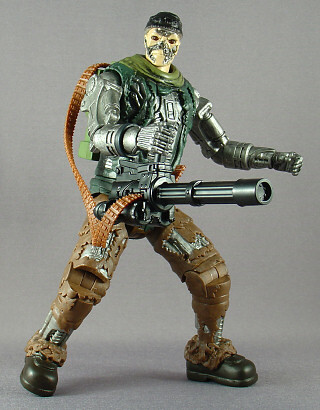 In addition to the heads, the T-600 comes with a Vulcan cannon that can be mounted on either of the T-600's arms (it looks and fits best on the right), a bullet belt that feeds through the gun, and a back-mounted device of some sort to which the bullet belt connects. These three accessories come assembled in the appropriate setup in the package, but they can also be detached from each other if you want a completely unarmed T-600... or one with just a backpack, an unloaded gun, a lone bullet belt, or any combination of these items. And Playmates had kinda spoiled me when it came to painted accessories, with most recent TMNT figures actually having weapons that weren't simply the color of the plastic, but it's back to basics with the T-600: there's not a speck of paint on his weapons. That said, while the black gun would have benefited from some drybrushing and a wash would have enhanced the appearance of the belt and backpack, they only really look bad because these are accessories that the T-600 has to wear... and because the paint job on the figure itself is so involved. If you're going to skimp on the paint apps, Playmates, you've gotta skimp across the board. And finally there's the spring-loaded waist, which is the most useless incarnation of this feature that I have ever seen on a toy. It'd make for fine punching action if the T-600 could actually turn more than the slightest bit in either direction -- but since he can't, he delivers the straight-up weakest hooks this side of Skynet Central. Or maybe he's supposed to be delivering quick, jerky sprays of gunfire. Whatever he's supposed to be doing, it looks hella weak. 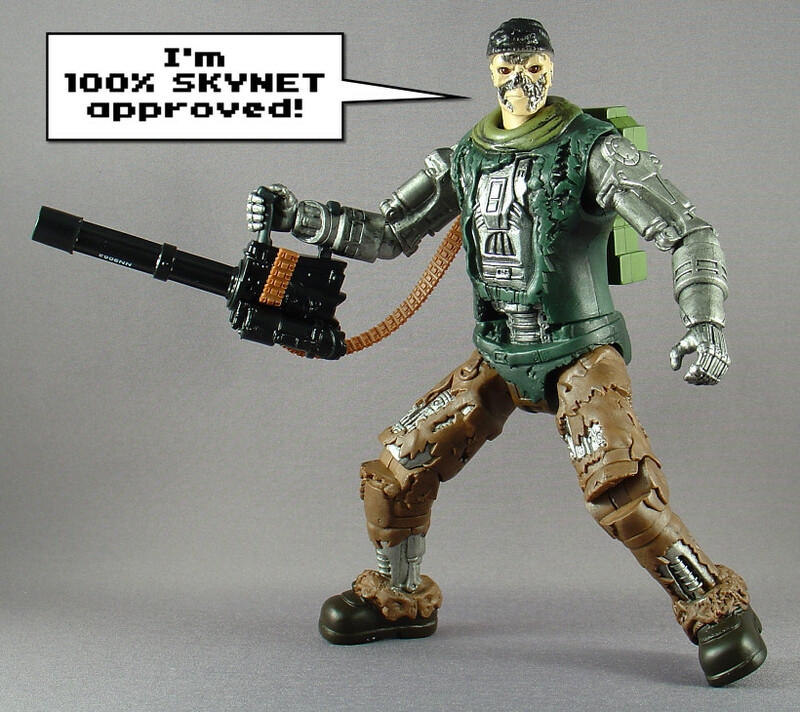 No wonder Skynet was phasing this model out during the events of Salvation. Oh, one more thing -- although mine didn't come with one and none of the Salvation figures at our Walmart had them, I've seen that a lot of the figures at other places come packaged with a trading card each. I'm not that worried about it, but if you want the card make sure you check the packaging to see if your figure has one! The main problem with the T-600 isn't that it's a bad toy, but rather that it doesn't seem to know who it's for: it's either a really average collector figure or a very, very good -- and overpainted -- children's toy. The action feature may be lacking, but kids will probably love everything else about the figure. It's decently articulated (it has the same amount of articulation as "Power Rangers RPM" figures, and its elbow swivels are much more useful than the RPM figures' calf swivels), has interchangeable heads and multiple accessories that attach to the figure, and is large and sturdy. A decade or so from now (perhaps in post-apocalyptic 2018...), I wouldn't be surprised if there were adults who fondly remember the T-600 as one of their favorite childhood toys. 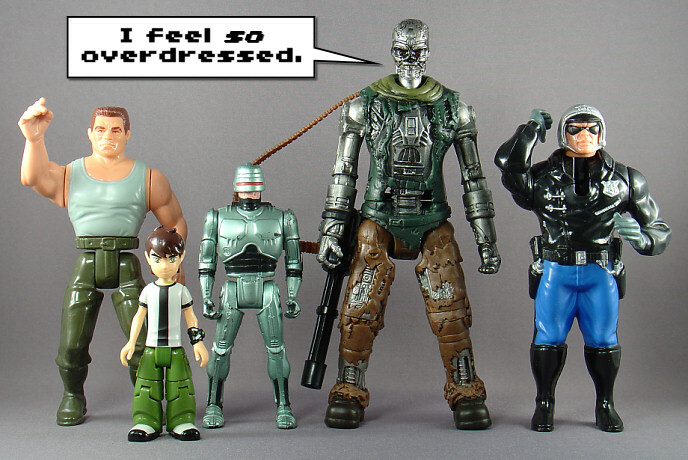 That's not to say that collectors can't enjoy the T-600, though. It may lack the pronounced Tarman similarities of its onscreen counterpart, but I still enjoyed sticking it with a couple of my zombie figures for the left image above. And given how difficult Mattel's DC Universe Classics Wave 5 was to find at Walmarts across the nation (I only ever saw Riddler, hence the lone piece in the right image above), the T-600 could also do double duty as Metallo. 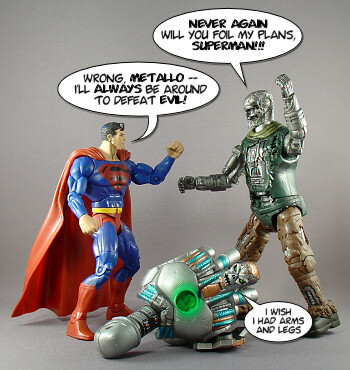 I mean, the character's looked all kinds of different ways in the comics -- many of which do recall Terminator robots, to the point where some fans speculate that the modernized Metallo actually takes his appearance from Skynet's brood -- and the figure itself is big enough to look like a match for even a DC Direct Superman, let alone a DC Superheroes or DCUC one. As long as you don't focus too heavily on the rubbery-looking clothing (or pretend he's wearing a rubber outfit for some reason), it works. 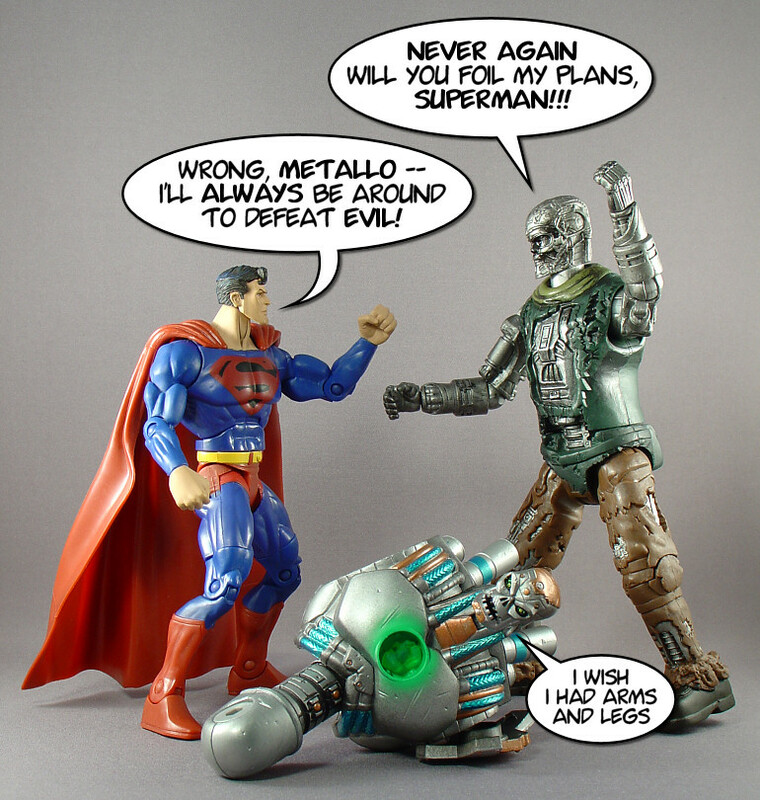 Heck, you can even have the T-600 fight Superman as a Terminator. It's not like Clark hasn't tangled with them before! But if nothing else, Playmates's T-600 figure makes for a nifty Terminator: Salvation "souvenir." 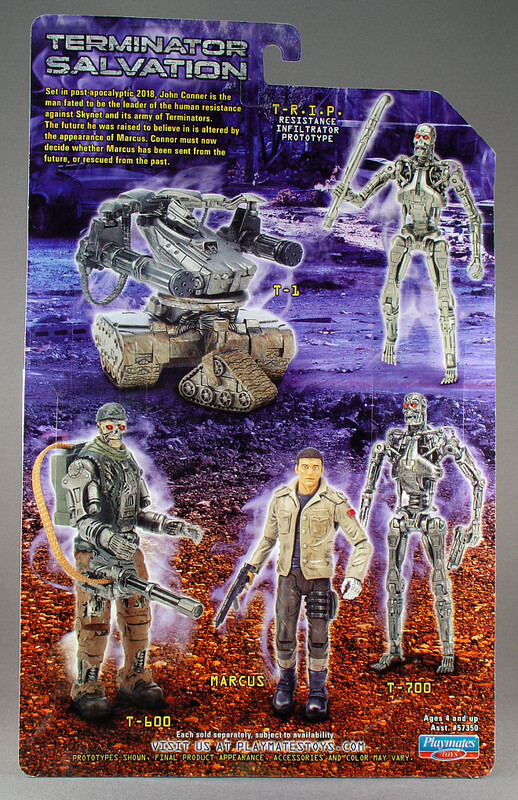 With one notable exception, the T-600 was the most prominent Terminator in the fourth film -- so while you'd be better off with the NECA T2 endo if you want a standard endoskeleton, the Playmates T-600 is the one to get if you'd like a 6"/7" scale cyborg from Salvation. It doesn't hurt that it's the best value of the Playmates Terminator figures either, with it being the largest and most articulated of the bunch. Even if you're just picking it up to stand in the background (where its rubbery clothing wouldn't be quite so noticeable) of some grand futuristic battle royale, a 7.25" figure for $8.97 (at Walmart; $9.99 elsewhere) is a pretty good deal. 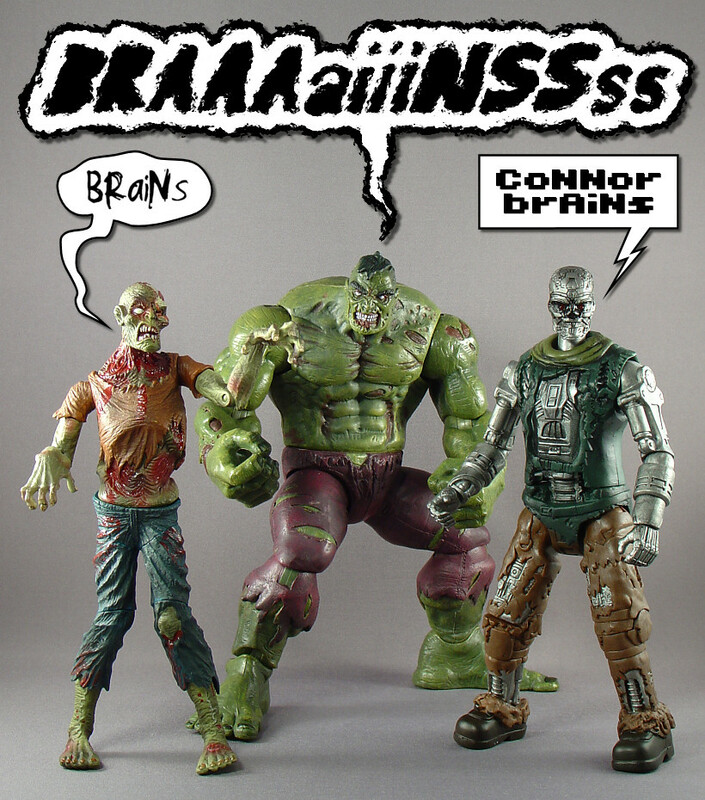 I can't quite recommend the T-600 to collectors... but I can say that they probably won't be markedly unhappy with it.